Shepherd won both of its games on Monday afternoon, March 19, in its double-header against the Glenville State Pioneers with a 10-2 win in the early game and a 20-3 win in the second game. With the two wins, the Rams’ overall record improved to 8-8 and 3-1 in the MEC, as the team now sits at a .500 winning percentage. Glenville State has a 4-13 overall record and fell to a 1-3 record in the MEC with two losses to Shepherd on Monday afternoon. In the first game, the Rams were able to score early in the top of the first inning to put the pressure on Glenville with an RBI-single from sophomore catcher Christian Hamel, which brought junior right fielder Nick Atkinson around home plate for an early 1-0 lead. Rams’ junior starting pitcher Justin Smith (W, 2-1) held Glenville State scoreless in the early going while the offense built up a lead. The Shepherd offense added runs in the top of the third and fourth innings off a sac-fly from Hamel and an RBI-double from sophomore second basemen Eric Sloper to bring the lead to 3-0 heading into the fifth inning. 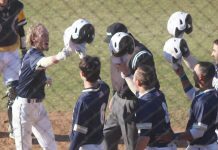 The Rams’ offense followed that up in the top of the fifth inning by blowing the game wide-open thanks to a seven-run outburst with the catalyst coming from sophomore shortstop Trenton Burgeen. Burgeen hit a grand slam home run to extend the lead to 9-0, but the Rams were not finished. Sophomore center fielder Brenton Doyle capped off the Rams’ offensive output in the first game with an RBI-single, which drove home Sloper to bring the Rams’ final tally to 10 runs. Glenville State had an opportunity to make a comeback in the late stages of the game, but they could only muster two runs in the bottom of the fifth inning. The first game would turn out to be a 10-2 victory for Shepherd. Junior starting pitcher Brady Wilkinson picked up his fourth loss (0-4) of the season for Glenville State with the loss in the opening game of the day with the Rams. Moving onto the late game, Shepherd continued the momentum it acquired from the previous game with another outburst on the offensive end, this time scoring 20 runs. Atkinson started the scoring off in the late game with a solo home run in the top of the first inning. In the second game of the day, Atkinson put forth a four-hit, four-RBI, and four-run performance through his six total at-bats. 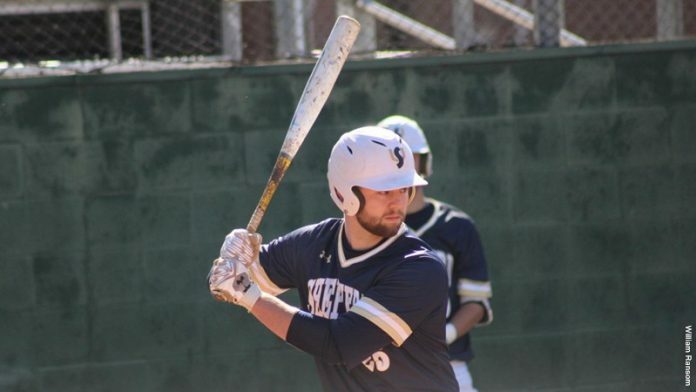 After Glenville State’s batters went three-up, three-down in the bottom of the first inning, the Shepherd offense put up 11 runs in the top of the second inning, thanks in part to a grand slam home run from senior first basemen Daniel Heleine to bring the lead to 7-0 temporarily. Rams freshman designated hitter Daniel Keer stole home plate a few batters later, as the team fully seized the momentum with an 8-0 lead at this point. Still in the same inning, Doyle, again, just like he did in the previous game, hit an RBI-single to center field that brought home Atkinson to provide the Rams with an 11-0 lead. Hamel, the next batter, singled, which allowed Doyle to make it around home plate to cap off the 11-run second inning for the Rams, as the score now stood at 12-0. Shepherd and Glenville State added runs in the third inning as the score sat at 13-1 until the sixth inning. The Pioneers added their final two runs in the bottom of the sixth inning on a two-run home run from junior third basemen Ryan Colaw. The top of the seventh and final inning saw the Rams add five more runs to extend the lead to blowout proportions with a 20-3 score. Junior shortstop Giovanni Torres smacked a two-RBI single that scored redshirt-freshman designated hitter Kendall Jordan and junior first basemen Eddie Nottingham that made the score 18-3 in favor of Shepherd. Atkinson capped off an all-around day from both games with his second home run of the game later in the inning, this time a two-run bomb that brought Torres home to score to set the final score at 20-3. 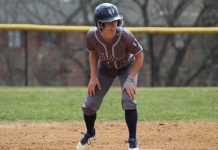 The Pioneers were not able to add any offense in the bottom of the seventh and final inning, culminating in the victory for the Rams. Wes Martin started and picked up the win for the Rams in the late game as he improved his season record to 2-1. 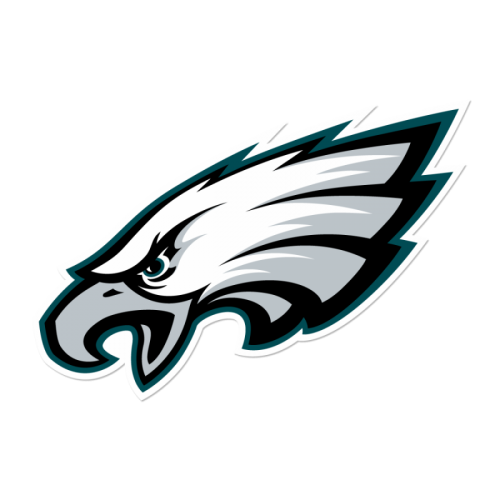 With the slated games against Shippensburg on Tuesday afternoon being postponed due to the weather, the Rams next game comes on Saturday, March 24, when they take on the University of Charleston Golden Eagles in a home double-header in Shepherdstown, West Virginia. Game one begins at 1 p.m., followed by game two at 3:30 p.m. 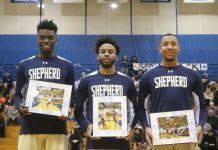 It is also Meet the Rams Day for members of the Shepherdstown community.